60W Big Power High Power. 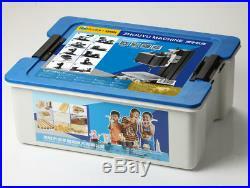 10 In 1 Kit Soft Metalworking Woodworking DIY Hobby Model Making Craft Child Gift. 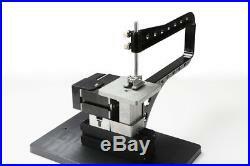 Can be assembled into 10 kinds of machines with different function. Operating Manual Book (8 languages). Motor case and headstock are jointed. Maximum motor power is 144W by using more powerful motor. 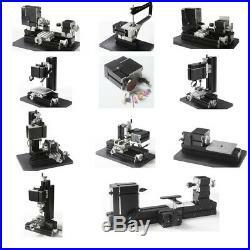 The parts in the kit can be assembled into 10 kinds of machines with different functions. Bow-arm jigsaw, wood-turning lathe, metal lathe, beads machines, milling machine, drilling machine, sanding machine, hand-held machine, dividing machine, big wood-turning machine. Only one kind of machine can be assembled each time. Main parts: headstock, central block, jigsaw base, jigsaw casing, motor blade, gear, woodturning chisel base, cross slider, big slider, drilling lever, drilling table, jigsaw table, connection piece, tailstock, sanding paper panel, dividing positioner, vice(all of the parts above are made of metal), drive belt cover, grinding wheel, wheel guard. Motor speed :12,000rpm/min(optional choice 20,000rpm/min) 2. Input voltage/current/power:12VDC/5A/60W, Switching power input: 110V-240V 3. Jigsaw working table size:90mm90mm 4. Maximum working material diameter of metal lathe and woodturning lathe:50mm 5. Working material length of metal lathe and woodturning lathe:135mm 6. Center height of metal lathe:50mm 7. Slider travel: axis X 145, axis Y 32, axis Z 32. Drilling working table size: 123100mm 10. Maximum workpiece size clamped by vice:50mm 11. Maximum workpiece diameter clamped by three-jaw chuck:50mm 12. There are three circles of holes on the dividing plate and each circle with the same ratio holes. The number of the holes on each circle is respectively 36,40,48. We can choose them as needed. Working material thickness of jigsaw: hardwood 4mm, plywood 7mm, soft wood 18mm, aluminum 0.5mm, acrylic 2mm. It is a good tool for families and schools to do model airplane and other wood model crafts. Main parts include headstock, central block, jigsaw base, jig-saw casing, motor blade, gear, jigsaw table, connection piece , drive belt cover etc. All of the parts are made of metal except drive belt cover. With special design, the reciprocating blade is touch safe in case of finger contact -it just causes slight vibration without cuts when skin contact. Allow straight-line cutting and curve cutting. Working table size:90mm90mm 4. Maximum working material thickness: solid wood-4mm, plywood-7mm, soft wood-18mm, aluminium-0.5mm, acrylic-2mm. The transformer has over-current protection, over-voltage protection, over heating protection. The material of bow-shaped arm with its accessories is metal which increases its durability. 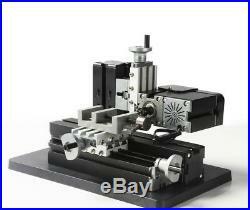 Mini Metal Lathe(Heightening type). Main parts: headstock, tailstock, long machine bed, slider, motor blade, gear, connection piece, drive belt cover etc. Center height-25mm, distance between center-135mm, motor speed normally will drop to 2000rpm/min when it machines metal. Lathe tool is made of high speed steel quality material and it can process soft metal, nonferrous metal and precious metal. By using central block, diameter can be expanded to 100mm. Maximum working material diameter:20mm 4. Working material length:135mm 5. Axis Z slider travel :32mm Axis X slider travel:145mm 6. Working material: lignin plastic, soft metal gold, silver, copper, aluminum etc. 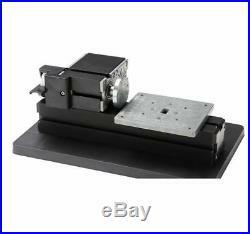 With 0.02mm scale line , the hand wheel increases the precision when processing. Main parts: headstock, motor blade, tailstock, long machine bed, big slider, woodturning chisel base, connection piece, gear, drive belt cover etc. Softwood, hardwood can be processed. 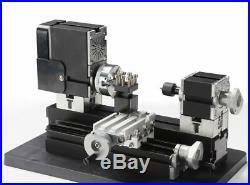 Workpieces can be clamped by three-jaw chuck or collets(1-6mm), center height-25mm, distance between center- 135mm. Maximum working material diameter: 45mm 4. Working material: wood, engineering plastic, soft metal gold, silver, copper, aluminum etc. Main parts: headstock, long machine bed, short machine bed, big slider, small slider, motor blades, connection piece, radial arm, drilling table, gear etc. All of the parts are made of metal. Working material: wood, soft metalcopper, aluminum etc. Axis Y /Z travel :32mm Axis X travel :145mm 4. Working material: lignin plastic, soft metalgold, silver, copper, aluminum etc. Milling cutter, with two edges, is dangerous, so people should be guided by experts when using it. Main parts: headstock, long machine bed, short machine bed, big slider, small slider, motor blade, connection piece, gear etc. Axis Y, Z travel :32mm Axis X travel:145mm 4. Maximum working material size clamped by machine vice:50mm 6. Working material:lignin plastic, soft metal gold, silver, copper, aluminum etc. Main parts: headstock, long machine bed, drilling working table, motor blade, connection piece, gear, sanding paper panel etc. (All of the parts above are made of metal)grinding wheel , wheel guard. The machine can be used to polish , grin. If needed, we use the machine by hand to grind under any angle. Center height 25mm, sanding paper:100# (optional), choosing the sanding paper according to different workpiece Technical parameters: 1. Working table size:123100mm 4. Main parts : headstock, sanding paper panel etc. Equipped with 7 standard grinding tools, widely used, variously used, easily used. With drilling bit, grinding wheel, milling cutter, it can respectively turn into hand-held driller , grinder, miller. The transformer has over-current protection , over-voltage protection, over-heating protection. High Power Metal Drilling Machine With Dividing Plate. Main parts: headstock, radial arm, long machine bed, short machine bed, small slider, big slider, motor blade, connection piece, dividing positioner, gear etc. By using dividing plate, we can drill the round workpiece equally. There are three circles of the holes on the dividing plate and the number of the holes respectively is 36,40,48. Maximum workpiece diameter clamped by three-jaw chuck:50mm 5. Slider travel: axis Z-32mm, axis Y-32mm, axis X-145mm 6. The transformer has over-current protection, over-voltage protection, over-heating protection. With 0.02mm scale line, the hand wheel increases the precision when processing. 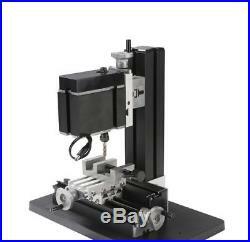 Mini Metal Horizontal Milling Machine. Motor case and spindle box are jointed. All of the parts above are made of metal. 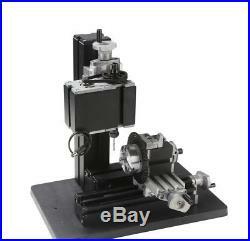 Maximum working material size of machine vice:50mm 6. Working material: wood, soft metal gold, silver, copper, aluminum etc. Main parts: headstock, tailstock, long machine bed, big slider, wood-turning chisel base, motor blade, gear, connection piece, drive belt cover etc. 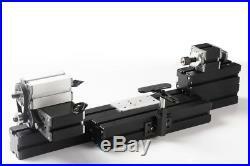 Workpieces can be clamped by three-jaw chuck or collets(1-6mm), center height-75mm, distance between center- 300mm. Maximum working material diameter:150mm 4. Working material length:300mm 5. Provide it when you order. Remote is defined as islands and highlands; or a post code/zip code that is difficult to serve; or a suburb/town that is distant, inaccessible or infrequently served. DHL remote areas range can be checked here. 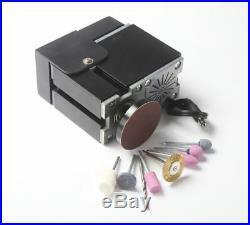 1 X High Power Mini Metal 10 In 1 Kit. 1 X Operating Manual Book. The item "60W High Power Mini Metal Lathe Mill Woodworking 10 In 1 DIY Model Making Craft" is in sale since Friday, July 28, 2017. 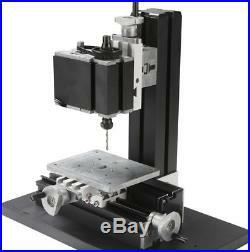 This item is in the category "Business & Industrial\CNC, Metalworking & Manufacturing\Woodworking Tools & Supplies\Other Woodworking". The seller is "prettyworthshop" and is located in Shenzhen. This item can be shipped worldwide.